Carla, can you do me a favor eh? Please, oh please, take some time to visit Quiapo, Avenida and Raon. And one more thing, please ride the ferry that goes over the Pasig River. That was Mark. A thin tall blond Danish guy I met during a trip to Siquijor and Apo Island (together with his Filipina girlfriend). 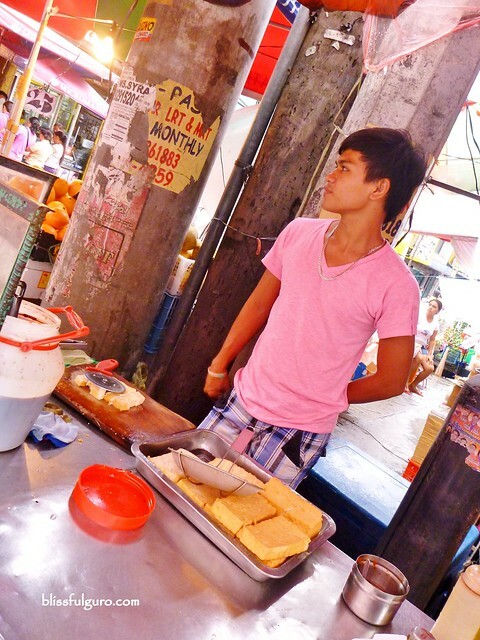 He went on with his Quiapo adventures as if he was telling me about his hometown. The soliloquy continued for the next few hours over some huge Gold Eagle beers. He was Danish. I am a Filipino. It seemed like we were both on the wrong side of the beer table. He spoke of Quiapo like a legit Nazareno Devotee. Me listening to every word he said like an ardent admirer. He never even mentioned about it being unsafe. He described it as Crazy and Beautiful Quiapo. Uhm, lost love na lang? Since then, I looked at Quiapo differently - unlearning all of my Quiapo judgments every time I went there. Funny how for four years I passed by this area almost everyday and never saw what Mark was eagerly telling me about. So maybe there's more to Quiapo than the church and the peddlers. So when I was asked by a friend for an errand run to Raon, I took this chance to be in Mark's shoes for that day. Food tripping was never on our list that day but maybe because of our love (borderline obsession and glutton) for food, we walked around and checked out what's in store for our bellies in Quiapo. First stop was a hole in the wall burger place that was a hit among everyone passing by it. 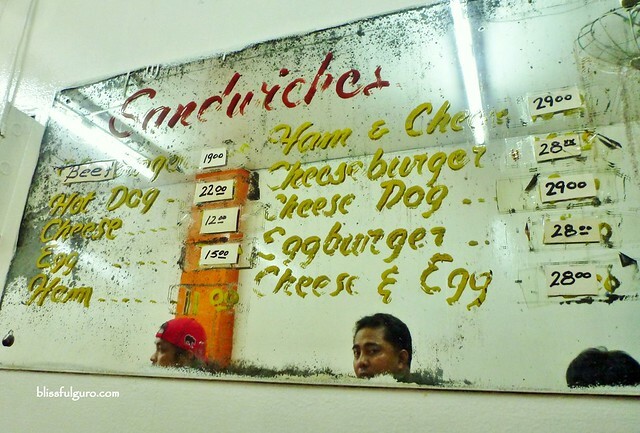 It's the Boulevard Hamburger place sandwiched between bicycle shops and motels along Quezon Boulevard in Quiapo. We got there by crossing the footbridge from Raon (Quiapo church side) to get to the other side of the road. It's somewhere along the bicycle shops, ukay-ukay shops and motels. We went inside and noticed how legit the place was. It's like we were transported into the 60's era. That very tight and almost a meter and a half wide alley is truly an old school one. The place was packed at around 2:30 in the afternoon. And I truly understand why, this place was never meant and not even trying to be a chill-out place. People come and eat and go. That simple. 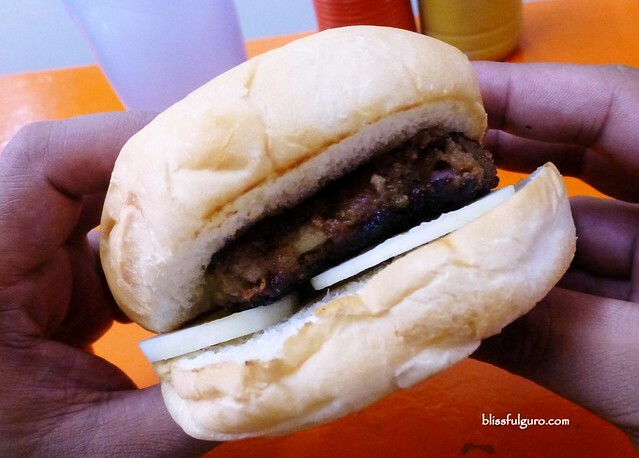 They've got some burgers and sandwiches but we chose to have the classic Beef Burger for 18 pesos each. It was screaming 100% pure beef from the signage outside. And right after the first bite we were convinced, there's nothing special about this burger. It's just like one of those burgers that you can get on popular burger joints around town. 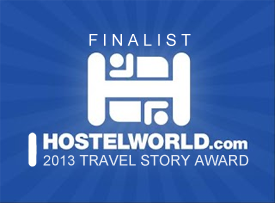 What was so special here was the ambience and the feel of the place - it was truly an experience in itself. Me and my restless feet went around to, I dunno, just walk around when I saw this peddler who was mobbed by the burger joint's staff. I was so curious so I joined the crowd and saw what everyone was raving about - lumpia. 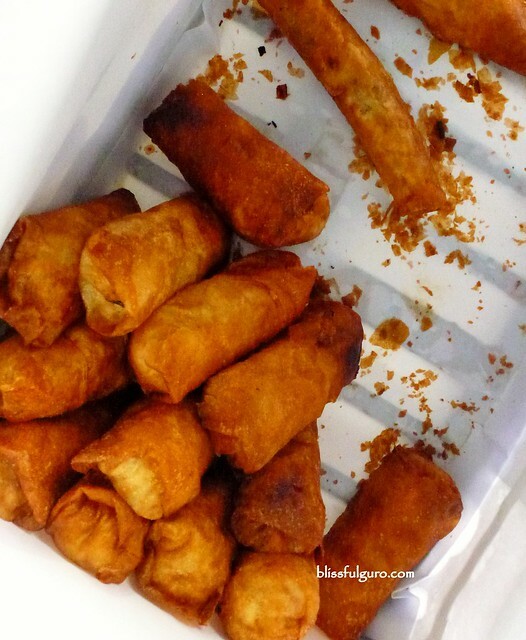 I observed how these lumpias were served and I was enticed. He kept on mentioning that he personally made all of those with love. And so he sold me on that. I bought Fresh Lumpia (with generous serving of the sauce) for 15 pesos and Fried Lumpia for 10 pesos and brought it inside the burger place. The fresh one tasted good considering its price. The filling was tasty and the crepe was on the soft side. The sauce was not that overpowering which was the deciding point. It was on the sweet but not so garlicky and nutty side. The fried one was just ok. Nothing to rave about it even the vinegar dip. As if we were not yet full yet with our merienda, we passed by this food cart along Hidalgo and Gomez streets (in front of SM Carriedo) and forgot that we just ate. Siomai for 7 pesos each and Fried Tofu for 15 pesos per order were on sight. We tried both food items and gladly loved them both. 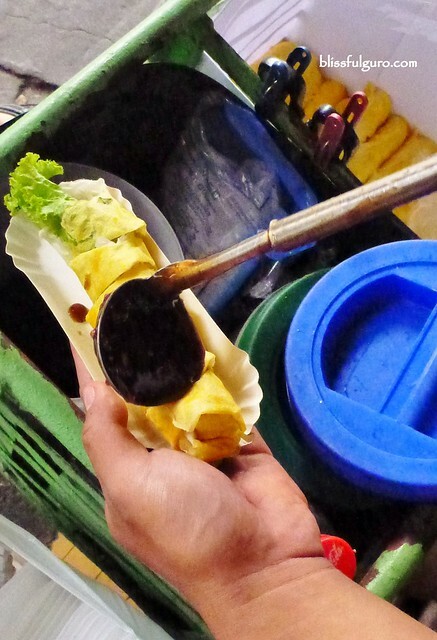 The bigger than usual siomai wasn't filled with carbo-extenders that you can feel and taste the meat inside it. 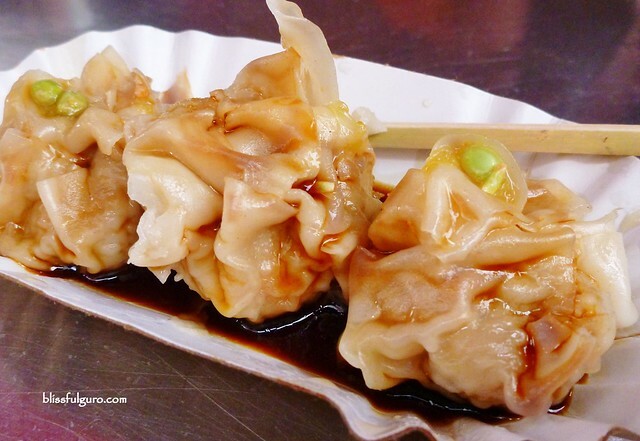 The sauce also complemented the huge siomai. 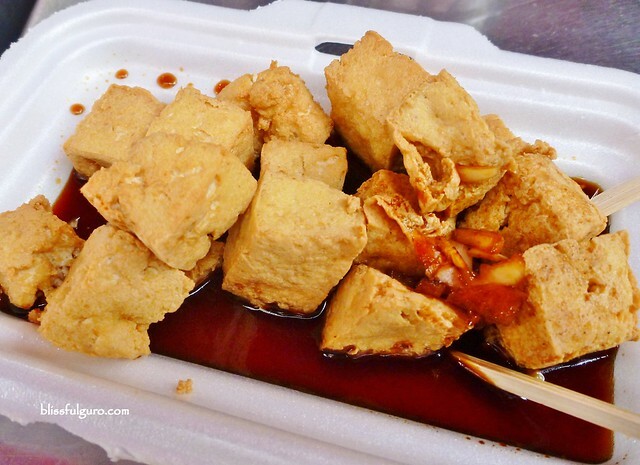 And then the fried tofu/tokwa. 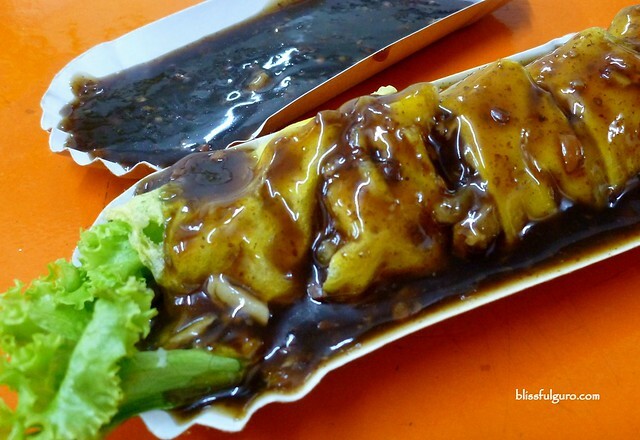 They cut it into pieces before dipping it in hot cooking oil and fried it to perfection. I love the perfect balance of the tofu's crunchy outside and soft inside with the perfect dipping sauce. 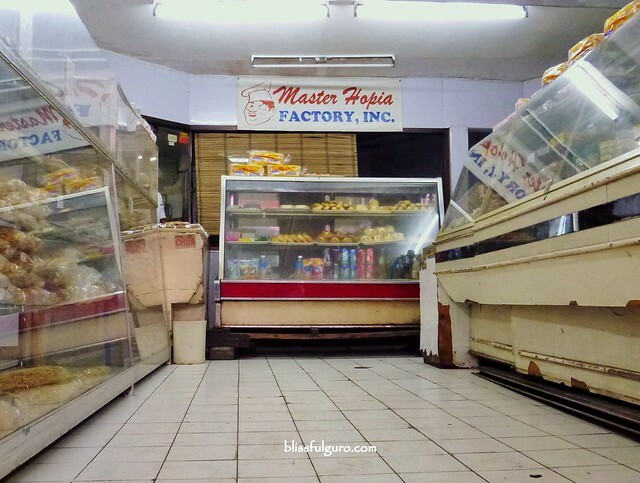 We went straight to Palanca street and turned left to Villalobos street and spotted my mom's favorite - the Master Hopia Factory. This is just a few meters away from the Quinta Market. 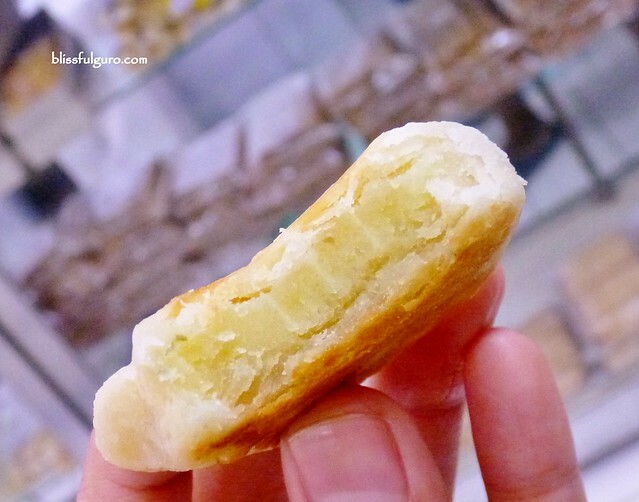 My mom never fails to request for this certain hopia every time I tell her that I will pass by Quiapo. It reminded her of her younger years when she and my dad would go there for quick snacks. 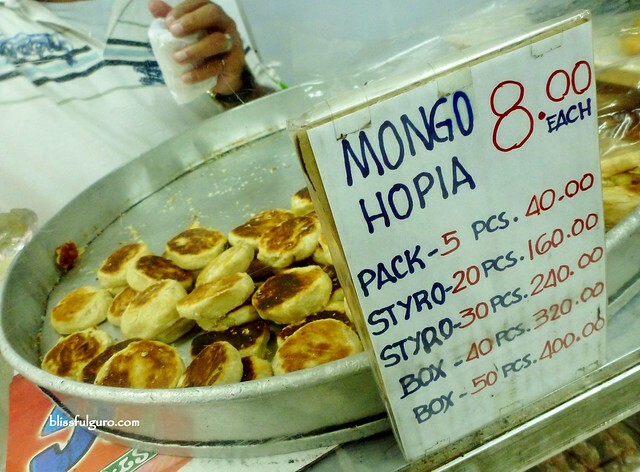 There were a number of hopias to choose from but my favorite here is the Mongo Hopia for 8 pesos each. And this is perfect with a bottle of soda. The dough is not too flaky nor too thin and the filling is not too sweet nor bland. This has been my favorite hopia too. Thanks to my mom. The day didn't just end there. We went to the Muslim Town of Quiapo in search for halal food but the rain ruined our hopes on finding one. We could've waited for it to stop but it pushed us back to the other side of the road, the Quiapo church. And then I squeaked, I've never been inside the Quiapo Church! And that marked my very first visit to one of the most famous churches in the country. We spent around 70 pesos each for this food trip. That couldn't even purchase my favorite cheeseburger meal but then I wouldn't trade this food trip for that fast food treat. Am gonna call Mark right now. 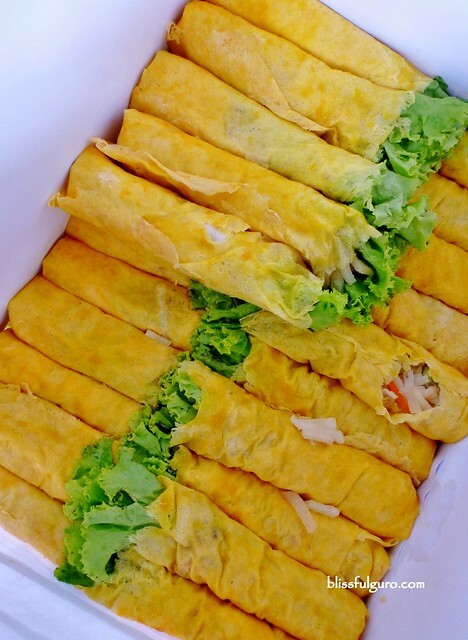 My buddy has been bugging me to go to this stall in Raon to try out their fresh lumpia or spring rolls. I don’t dig spring rolls that much but just to shush him, I approved of his longtime wish. Globe Lumpia House has been around for more than fifty years and from what I heard, they offer the best fresh spring rolls in the area (or maybe in the metro). 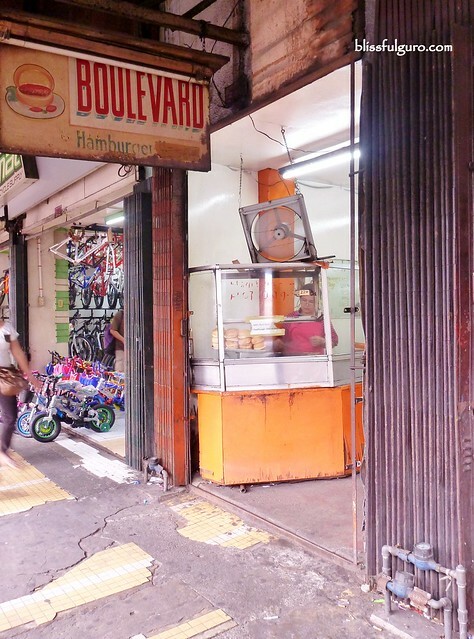 For first-timers, it’s quite hard to find this hole in the wall near Quiapo and Recto, but you can ask around and people will lead you to the right place. I’ve been there thrice already and every time we went there it’s as if the queue was for a certain lottery that has the biggest jackpot prize ever; it’s always jam-packed. In some days, they close as early as lunchtime if they already emptied their trays. They have a seating area before but recently, they remodeled to just have a take-out corner rather than convincing their customers to grab a bite with the convenience of seats - I'm not a fan of take-outs though. My buddy can finish three! 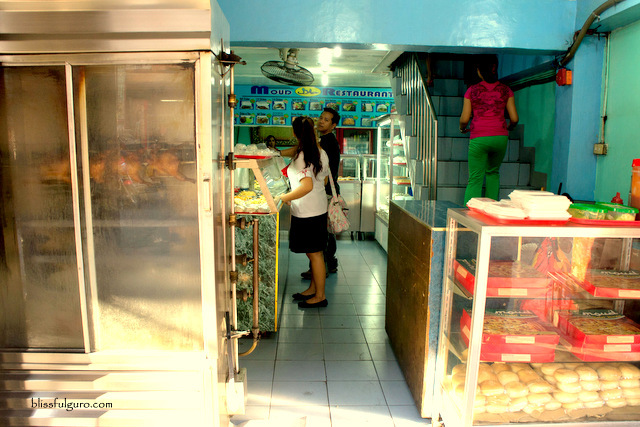 For 18 pesos, what do you think is the difference of their fresh lumpia with other stores? First is that they make it fresh every time and all the time. 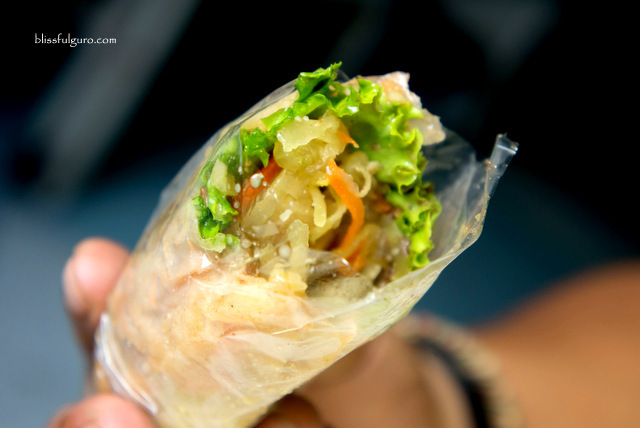 You may want to check out how your lumpia is made through the clear glass where they assemble your order. 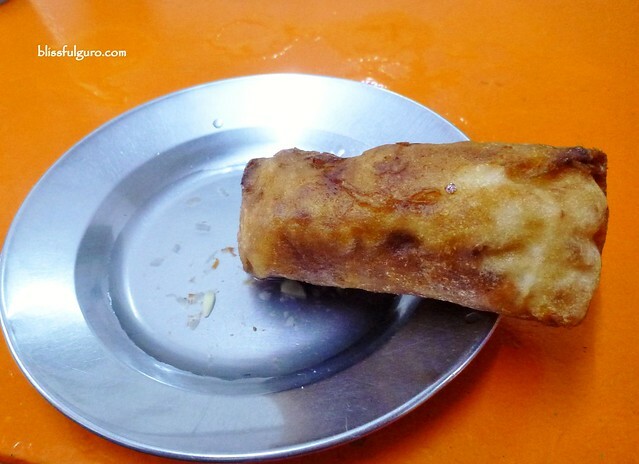 Next is that the lumpia is served on bite sizes with special peanut-garlic and hot sauce. Lastly, it’s really yummy. The explosion of sweet, garlicky and peanut taste is just too perfect with the right amount of veggies inside the crepe. You have to try it to believe it, as they say. 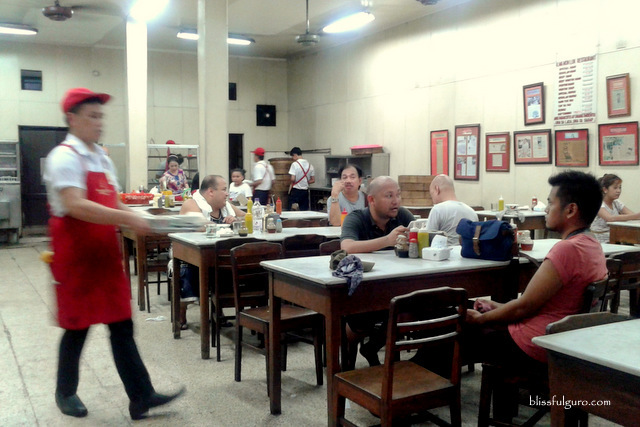 If you grew up in Manila then you’ve probably heard of the most famous noodle house in Quiapo. 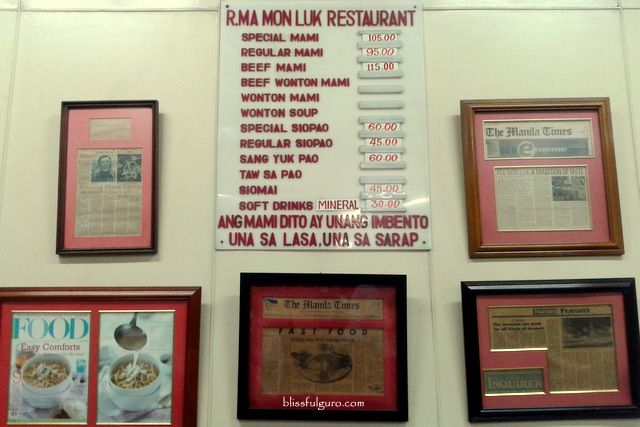 Ma Mon Luk Restaurant has been around since the 1930’s. 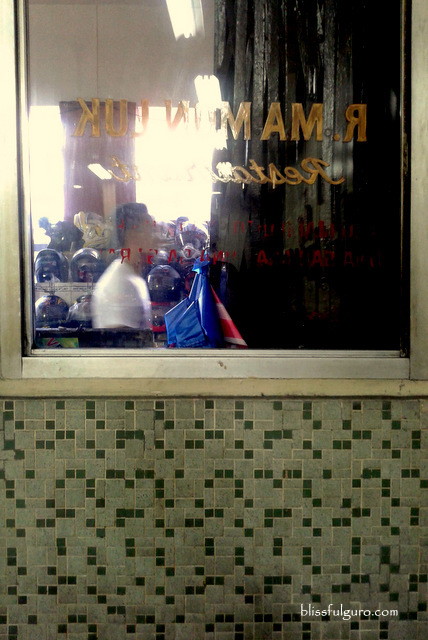 The humble beginnings of the original owner, Ma Mon Luk, is quite interesting. An immigrant from Guangzhou in China, he started selling out the original mami or hot noodles on streets with a typical metal containers with bamboo pole as support. He was the one who introduced the idea of hot noodles in the country with his own handmade egg noodles naming it mami (ma = his name | mi = mister). Clever eh? Moving on, me and some of my travel buddies were having a Sunday food tour around the area. We showed them our fave food stops until we ran out of places to satisfy our cravings for legit food in the area. 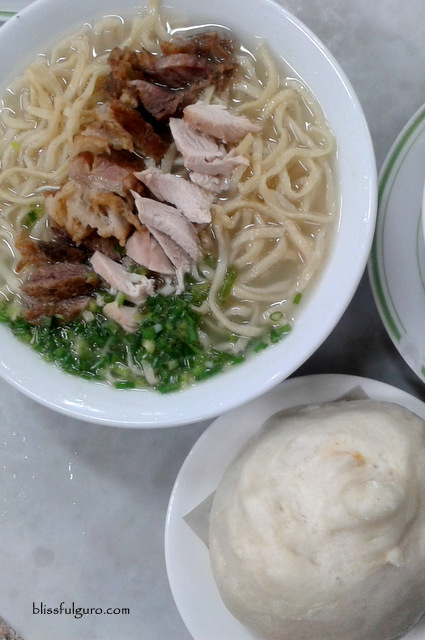 We then saw Ma Mon Luk along Quezon Boulevard and decided that we should try their famed noodles. We entered the old restaurant that seemed packed with hungry diners. The crowd was a mix of old and new generations. The former seemed to know what they wanted while the latter was consulting the menu posted on the wall for the options (just like us). 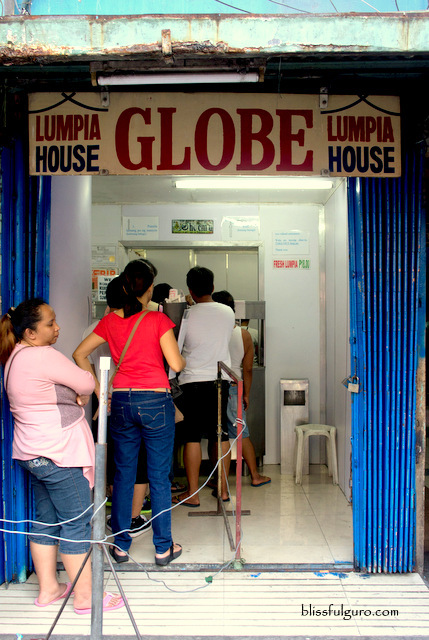 We ordered a huge serving of their Special Mami (105 pesos) and Special Siopao (60 pesos). Our food arrived in no time and we were all thrilled to try it out. Sadly, I wasn’t impressed with their mami. The soup was tasty but it overpowered the whole noodle dish. The broth has this weird stench that seemed to come from the chicken. The noodle is yummy on its own devoid of the soup. Same thing as the sliced chicken and beef strips, it was tasty and tender. I just didn’t like the soup at all. Well, a friend was raving about it and finished the whole serving. To each his own, I guess. The siopao has a different story. Paired with the special sauce, the pork asado and salted egg filling were yummy. 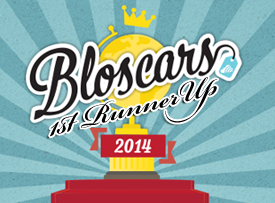 Overall, I think the restaurant has its own followings of customers who are craving for that type of taste. That’s just not me. I want my mami and siopao to be as simple as it can be. 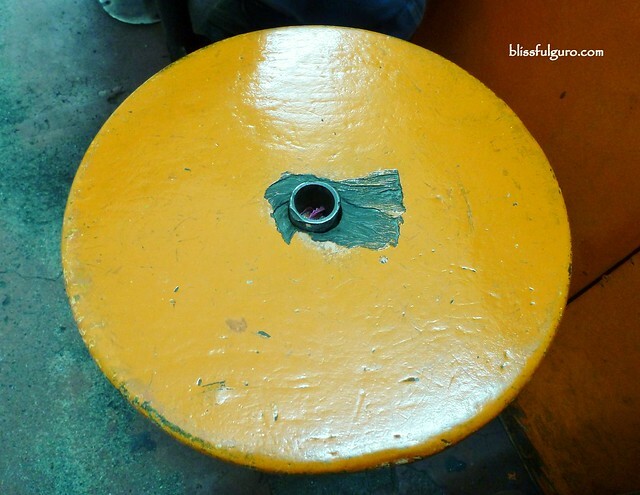 It was my buddy’s plan to show me around Quiapo and its hidden secrets. We went to the Muslim Community and felt like we were transported to Malaysia with the items that were sold on the streets. 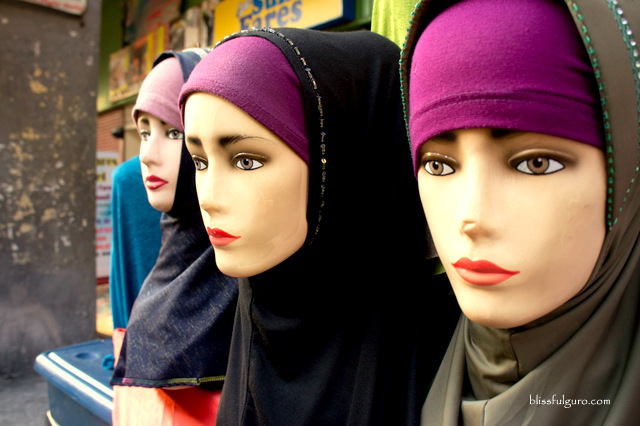 Halal food products, traditional hijab veils and fresh produce were lined on the streets. At the end of the street, I saw this mosque and my buddy said that we could go inside to check it out. We asked the security officers if we could take some photos of the mosque and he agreed, but only up to a certain area. 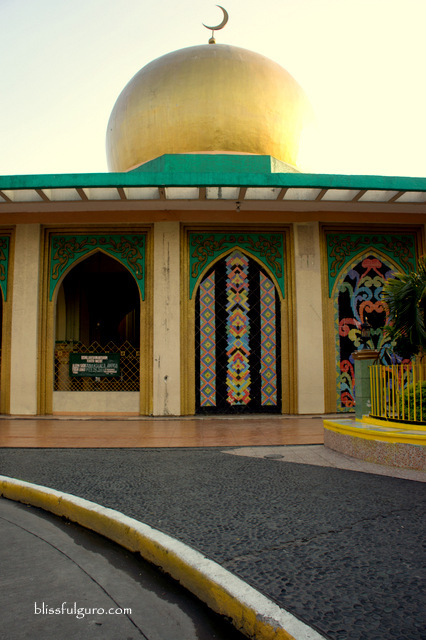 We entered the Manila Golden Mosque or Masjid Al-Dahab that is around 40 years old. 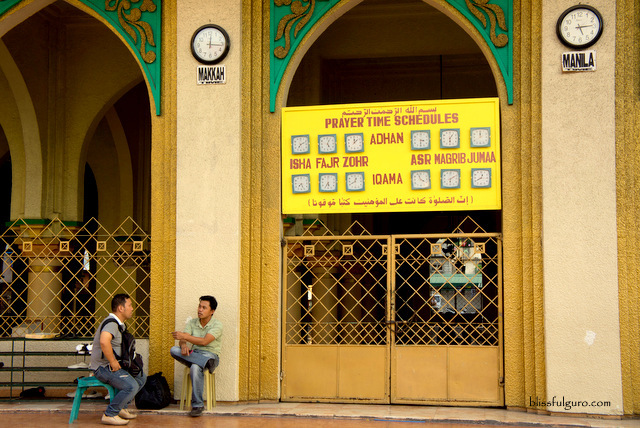 I took some snapshots and observed how our Muslim brothers were ardently praying. 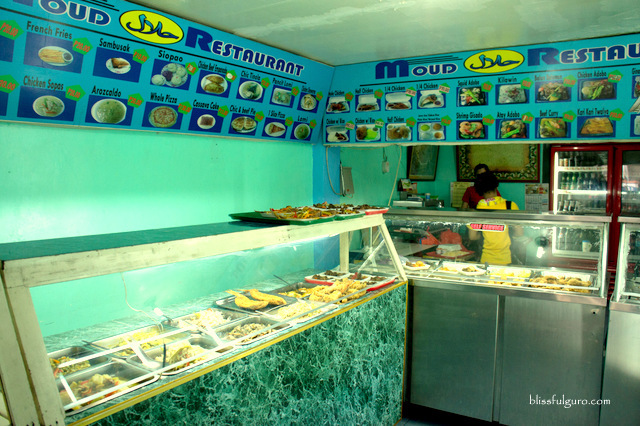 Moving on, we headed to one of the famous halal restaurants near the mosque, the Moud Restaurant. We had a hard time looking for it but the huge rotisserie at the entrance was our clue that we’re at the right place. 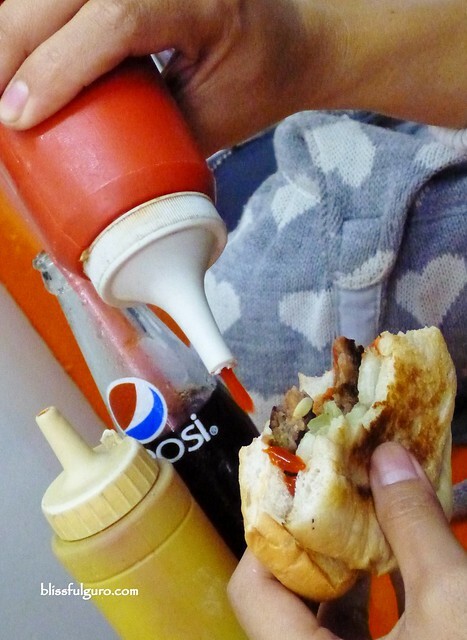 If you’re quite unfamiliar with the term, halal means actions or objects that are allowed under the Islamic law. 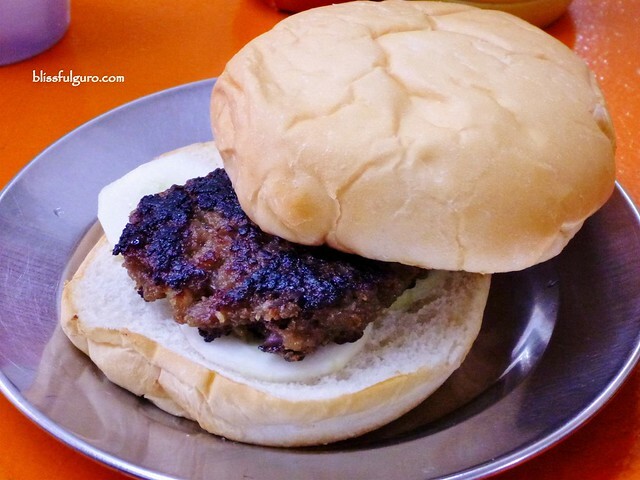 For food, it's not just that pork is prohibited; the animal has to be raised, handled and slaughtered according to specific Islamic practices to be considered as halal. 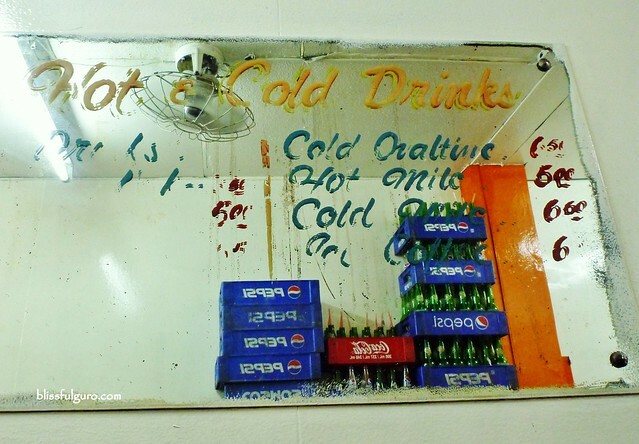 I so love photo menus! I heard that they serve the best roasted chicken in Quiapo and we had to sample it. Photos of the dishes were printed on a huge tarp with its corresponding amount. We just wanted one thing, their roasted chicken. We ordered Half Chicken (180 pesos) and some Biryani Rice (options of Biryani, Java or Kabsa rice). The chicken and rice combo was uniquely good. The special sauce complemented the chicken. It has this distinct flavor that is not the same as the roasted chicken I grew up with. This was a special meal prepared in a very special way. If we weren’t as full as we were, we might end up finishing a whole order of chicken. 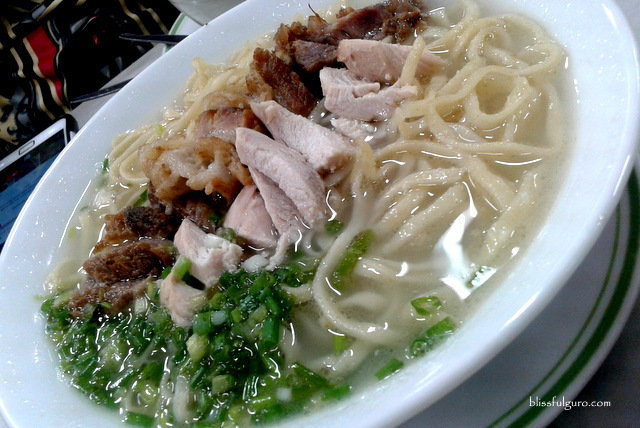 Open Hours: Everyday | 9:00 a.m. to 8:00 p.m.
namiss ko ang quiapo poro pancit lang na try ko jan sa quiapo sa may hidalgo st.
sa may mga bilihan ng camera sa hidalgo street papunta ng SM clearance quiapo yung kauna unahang SM mall ata yun, may mga nagtitinda dun ng mga ibat ibang uri ng merienda. Last memory ko sa quiapo was visiting it during the novena. But not to giddy trying what you have mention. My other half is saying, the place is not safe. Whoa, I should have listen to my alter ego's adventurous spirit. 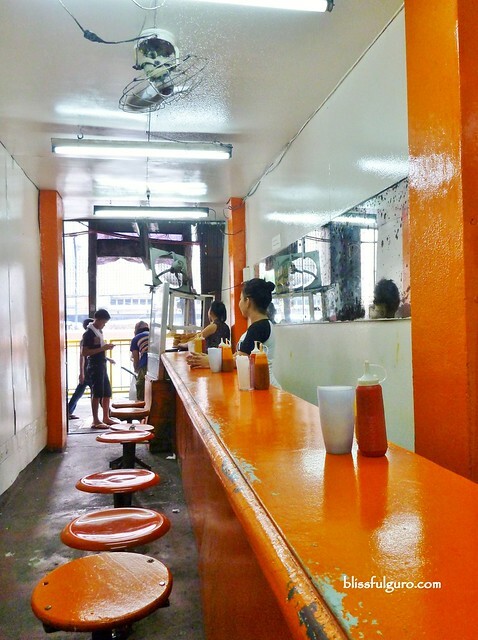 Your experience gives me a nod on second look on quiapo. 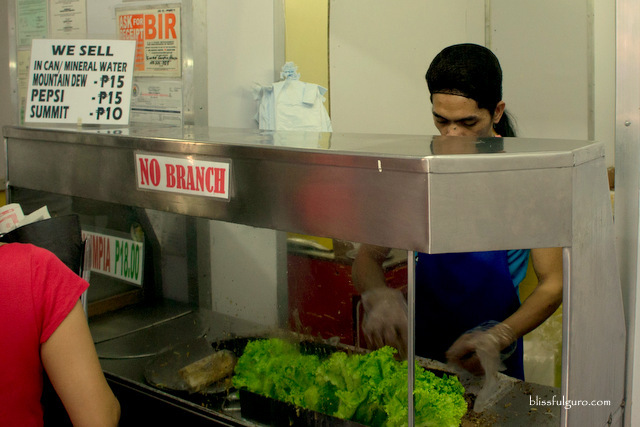 Kelan tayo mag foodtrip sa QC? 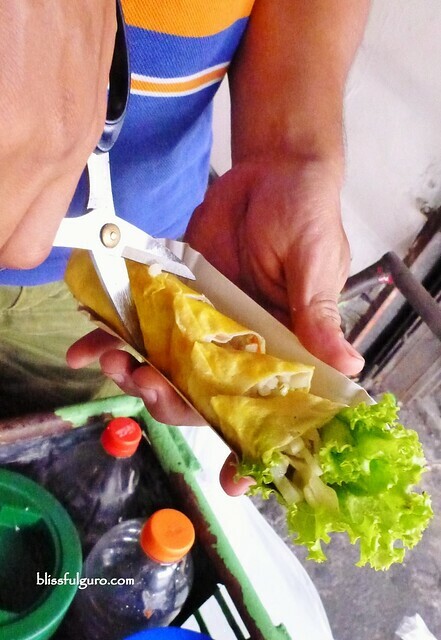 Ack fresh lumpiaaa! Bang for buck na rin. Nakakbili lang ako ng P15 fresh lumpia dito sa probinsya. Haha. Just bumped in to your web sir...nice. :-) Quiapo is such a wonderful place if you know where to look. 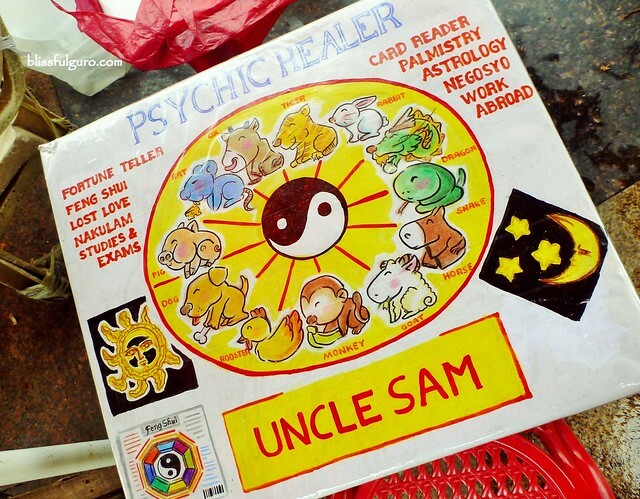 Lot of oddities and die die must try..and the good thing its close to Binondo where the old school really cool restaurants are situated. Going back to Quiapo I think you can really identify yourself as a Filipino when you are in Quiapo. I rather spend long periods of time there than in a plush Modern Mall. Well for me I visit Quiapo a lot...because of the MTB. 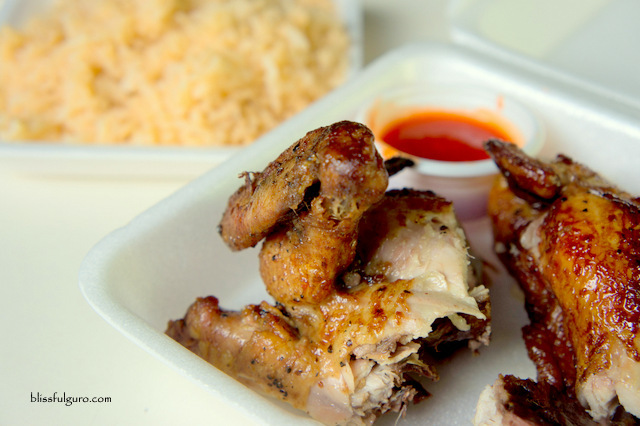 There is a place near the Golden Mosque...I think the name is Moud Halal Roasted Chicken..very good a die die must try. There is also a chinese food chain near Excelente...very cheap but good food as well. 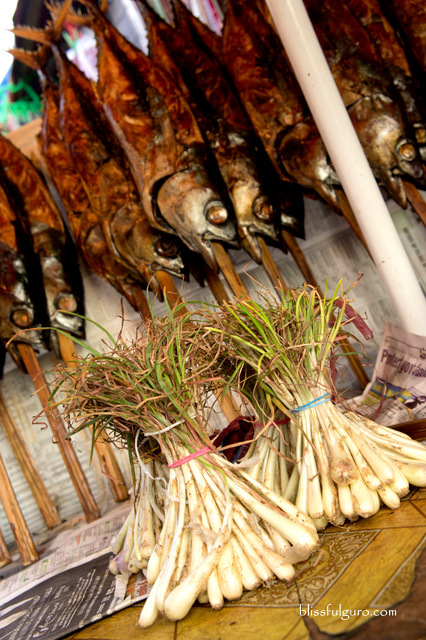 To sum up Quiapo...a foody & photographer's paradise. Definitely a die die must try. Thanks for this article.. Ang mas binabalikan ko sa Quiapo (Raon Specifically) ay yung burger store sa mismong baba ng raon foot bridge. 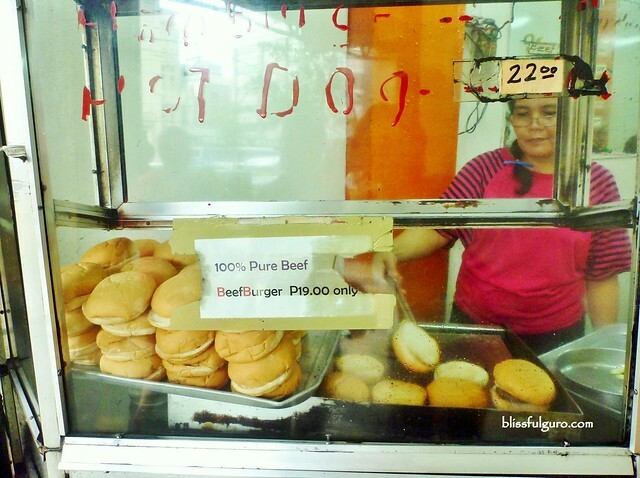 Masarap ang burger nila doon..